Two updates in one day - awesome right? Ok, so I wanted to share that I'm going to be participating in two blog challenges/read-a-thons this month. First is the Read Your Own Books Read-a-thon. For the month of August, I'm going to try to read only books that I own already or have received for review. This doesn't mean I won't buy any more books, but I'm going to try to avoid the library and focus on what I've got at home for the month. You can join in here! 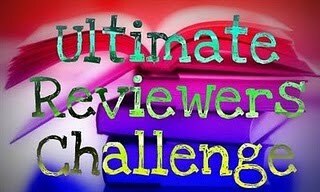 I'm also goign to be participating in the Ultimate Reviewers Challenge this month through All-Consuming Books, For What It's Worth Reviews, and Karen's Addictions. They have an awesome prize pack that I'm really hoping for a chance to win! Hopefully that also means you can expect a bunch of reviews this month. Finally, I don't think anyone can honestly say they aren't excited about the release of Mockingjay in less than three weeks! For over a year now Bestie and I have been having a Team Gale (me) vs. Team Peeta (her) debate. I've decided that in the days leading up to Mockingjay I'm going to host some Gale (awesome) vs Peeta (ew) games on here. The first one will be posted Monday and will be featuring Gale/Peeta haikus from me, Bestie, and some of my favorite blogger friends. I've also got an epic picture battle planned, we're making our own Team Gale/Peeta shirts, and we'll be choosing our own casts for the movie. Sneak peek: I think Spencer Pratt should play Peeta. Bwahahahah!!! Gale FOREVER!